Click here for additional mailing instructions. 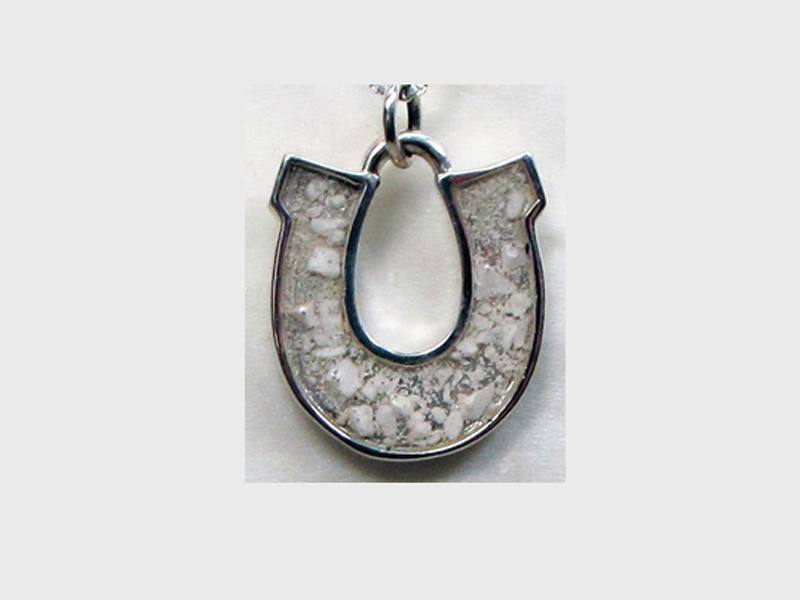 The Memory Horseshoe™ pendant measures about 9/16 x 5/8 x 3/32 that can hold a tiny bit of cremains. The cremains are sealed in place with clear resin enamel. Only one Memory Horseshoe™ can be created by Puppy Paws® at a time to insure that absolutely no cremains are mixed up or misplaced. Any cremains not sealed in the pendant are returned to the owner for safe keeping. The back of the pendant is flat for engraving which is done at no cost. Only one Memory Horse™ or Memory Paw® is created by the artist at a time to insure that absolutely no cremains are mixed up or lost. Puppy Paws® will engrave one name at no cost for the wearer. If there is room we would be happy to include a date. Memory pendants take about 2 to 3 weeks to complete.